Rebecca Bosch’s home is filled with the kind of vintage gems that were once destined for the trash. But with her keen eye, propensity for paint and a few helpful connections, she’s created one-of-a-kind treasures that infuse her home with style, charm, and personality. “I describe it as Shabby Cheap,” she says with a not-so-subtle note of pride in her voice. 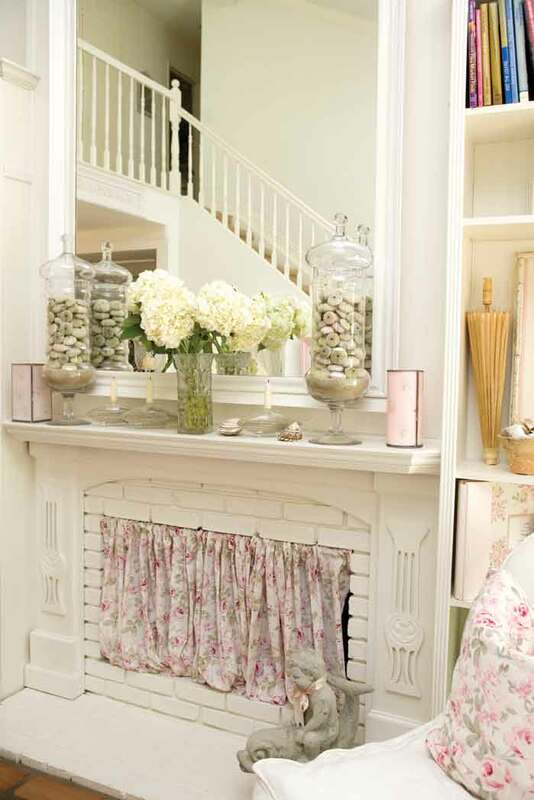 Walking through her home is a storytelling experience: the closet-door mirror a neighbor was tossing that she reclaimed and transformed into a grandiose mirror above the fireplace and the dingy chairbacks she acquired at a flea market that became fretwork for her fireplace are examples of her ingenuity, creativity and hard work. “It’s inspiring, gratifying and fun to see the before and after when you take something old and make it special,” she says. – If you are willing to refurbish things, you can get this look very inexpensively. Think outside the box. For example, you can find free things on the side of the road that have great potential. – Finding cast-offs and making them beautiful can become a fun hobby. It’s fun to explore; you never know where you’ll find the next great thing. – If it’s completely falling apart, then don’t invest your time and money. If it’s got good bones, a little love and care can really make the piece. – Get to know your style. Research magazines and pinpoint exactly what you love and what doesn’t move you. The more you know your style, the more successful and rewarding your shopping will be. – Look for things with character. Don’t end up with things you won’t be motivated to finish. With a little vision, some hard work and a lot of passion, you too can build a home one cast-off at a time. This entry was posted in Decor Inspiration and tagged Budget Makeover, DIY, flea market, Refurbish, Shabby-Chic, vintage by Flea Market Decor. Bookmark the permalink.